Наша программа предназначена для людей, желающих получить финансовую свободу, но неспособных сделать это, потому что они не финансовые эксперты. Fast Bank Investment - это долгосрочная программа частных займов с высокой доходностью, подкрепленная торговлей на рынке Форекс и инвестируя в различные фонды и деятельность. Прибыль от этих инвестиций используется для повышения нашей программы и повышения ее стабильности в долгосрочной перспективе. 10.09.18 09:12 Transfer Sent Payment: 200.00 USD to account U15926332 from U1294xxx. Batch: 227815927. Memo: Shopping Cart Payment. Deposit to Fast Bank Investment User allhyips. 11.09.18 20:05;Account;Receive;Received Payment 4.3 USD from account U15926332 to account U1294000. Batch: 228019410. Memo: API Payment. Withdraw to allhyips from Fast Bank Investment. Received Payment 0.85 USD from account U15926332. Memo: API Payment. Withdraw to Dmitry from Fast Bank Investment. 13.09.18 19:43;Account;Receive;Received Payment 4.3 USD from account U15926332 to account U1294000. Batch: 228259718. Memo: API Payment. Withdraw to allhyips from Fast Bank Investment. 12.09.18 19:45;Account;Receive;Received Payment 4.3 USD from account U15926332 to account U1294000. Batch: 228141825. Memo: API Payment. Withdraw to allhyips from Fast Bank Investment. 14.09.18 19:02;Account;Receive;Received Payment 4.3 USD from account U15926332 to account U1294000. Batch: 228373190. Memo: API Payment. Withdraw to allhyips from Fast Bank Investment. 16.09.18 12:16;Account;Receive;Received Payment 4.3 USD from account U15926332 to account U1294000. Batch: 228544228. Memo: API Payment. Withdraw to allhyips from Fast Bank Investment. 15.09.18 09:51;Account;Receive;Received Payment 4.3 USD from account U15926332 to account U1294000. Batch: 228426643. Memo: API Payment. Withdraw to allhyips from Fast Bank Investment. Memo : API Payment. 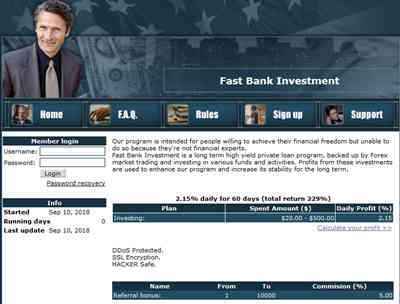 Withdraw to Dmitry from Fast Bank Investment. 17.09.18 20:03;Account;Receive;Received Payment 4.3 USD from account U15926332 to account U1294000. Batch: 228714087. Memo: API Payment. Withdraw to allhyips from Fast Bank Investment.